There’s a growing movement that supports Google+ as a next generation blogging platform due to it’s built-in interactive aspects, audience reach, search indexing, and digital capabilities. One of the biggest proponents of the movement is +MikeElgan and he recently posted about his support of Google+ as a blogging platform. Traditional blogging platforms provide methods for auto-generating an archive of posts. Archives can be chronological or topical and provide readers with a quick way to link or search into the contents. For writers using Google+ as a blog publishing platform, +ShawnHandran posted a way to create an archive of the Google+ blog posts. Handran’s method was to manually maintain an archive in a public Google doc spreadsheet. That made me think about my recent post of automating my digital life with the tool from If This Then That. 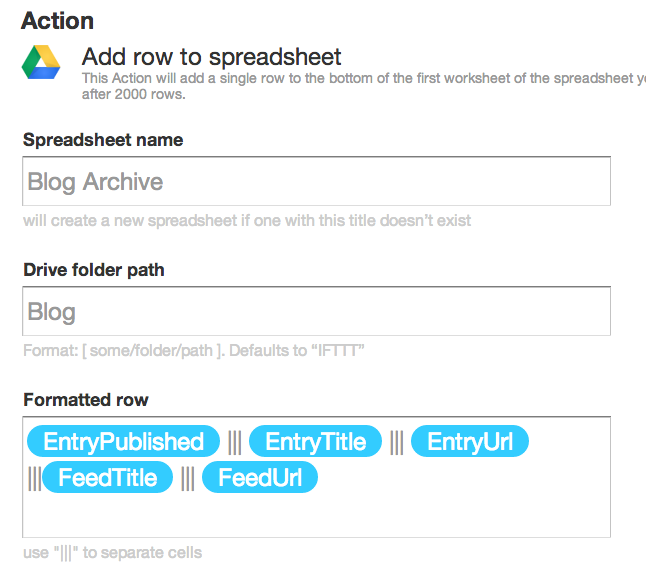 Using this service, it’s possible to automate a RSS feed into a Google doc spreadsheet. So putting the automated service together with Shawn Handran’s idea, here are the complete steps to create an archive for public Google+ blog posts. 1. Create an RSS feed for your Google+ public posts. There are many tools to do this. One that +MikeElgan recommends is Pluss Feed Proxy for Google+. When you visit the site you can choose the option to “Login with Google”. This will generate a URL for your RSS feed. 2. Create an account on If This Then That. 3. 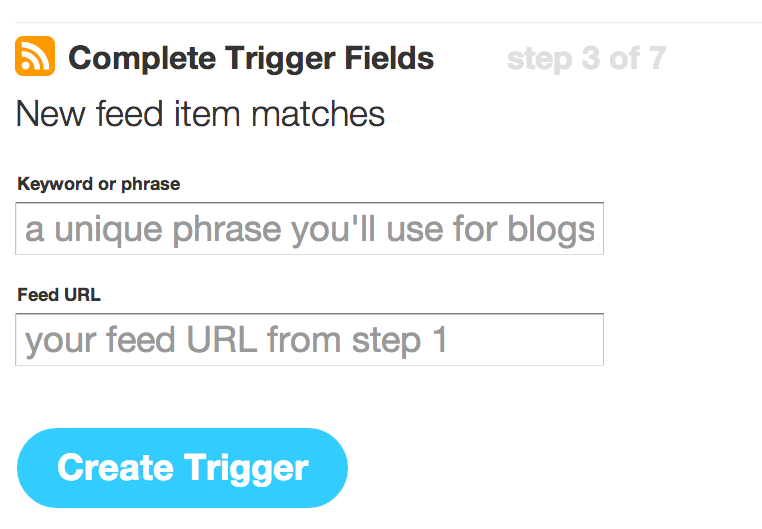 With the ifttt profile create a recipe that uses the RSS feed from step 1 as the trigger. There are two options: a) All RSS posts b) Posts that contain specific keyword phrases. I recommend using the option for keyword phrase matching because you may want to create public posts that are not blog posts. 4. Then for the output choose a Google Doc spreadsheet. 5. Share the google doc spreadsheet. Do this by clicking the share button in Google docs and making the file publicly viewable. Get the URL of the file. 6. Add the google doc archive to your Google+ profile. On your Google profile in the links area add an entry for Blog Archive and put the URL of the public Google Doc. That’s it! The recipe on IFTTT does not trigger automatically. But if you create a Google+ post and share with public using your keyword, then you should see the archive within 30 minutes or so. How many digital/online profiles do you maintain? If you are reading this, then chances are you have multiple online profiles and I’d bet a few more than you’d like to have. In fact, I bet you’ve created profiles on sites that you’ve long since abandoned or maybe even on sites that have long since disappeared. A newer dilemma in today’s digital landscape is just how to keep up with the all the sites and the volume of information inflow we see each day. When posting information do you find yourself copying information across multiple profiles or cross posting on multiple sites? When you take a spontaneous photo and send it to Instagram do you also post it Facebook? When you send a link to an article on Twitter do you also post that link on Google+? If you post a status update on LinkedIn do you also cross-post that status on Twitter? Ideally we post information on platforms that are relevant to the audience there. But it does happen that people make connections within the same audience group and that group spans multiple online profiles. Or you might find yourself taking content from a blog post, status update, email etc. and archiving it in a tool such as Evernote. Each individual tool has it’s own archiving capability, but you like to centralize all of the important stuff to make retrieval a bit easier. What I’ve framed in the preceding paragraphs sounds like a logical condition loop in programming “if this then that” (just need an ‘else’!). 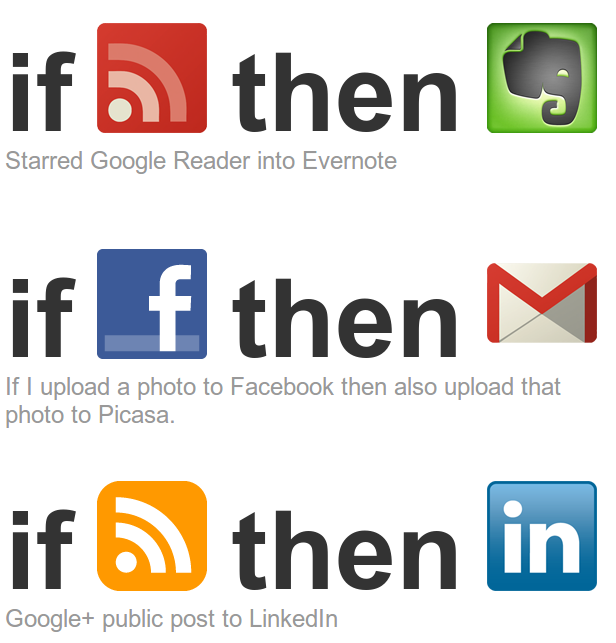 As you might suspect, there’s a site for that: IFTTT – Put the Internet to work for you. Describing this to people, I would call it a rules engine. You essentially define a digital channel, a trigger action from that channel, and then an action to a second digital channel. They call it a recipe. The point is to automate actions that you might already be doing manually. They are taking advantage of the application programming interfaces to connect profiles together. It’s like a switchboard of digital profiles. I created a few recipes. The tool contains many more digital channels to create huge number of possible combinations. There is also some flexibility in what information is transferred to the action channel. That’s in the setup. What tools do you use to automate your digital life?